But Dr. Sedillo credits his mother Mariana with being “the rock that kept the family together. You can imagine that raising six kids in foreign countries, with my father gone doing undercover work for months at a time, would require a strong, special woman,” Dr. Sedillo recalled. Dr. Sedillo met a cardiologist at the hospital who became an inspiration. He had trained at the Texas Heart Instituteand “I wanted to be just like him,” he said. But another job transfer by his father took him to Monterrey, Mexico, where he eventually attended medical school at the Universidad de Monterrey. 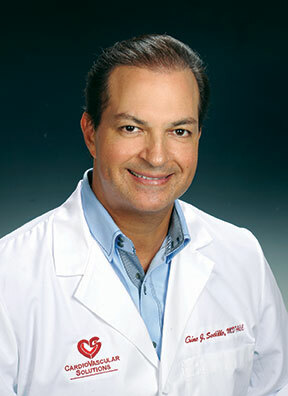 After graduation, Dr. Sedillo began residency at the University of Texas Medical Branch in Galveston. He was chosen to be chief resident, which helped him realize his penchant for teaching and also achieve his coveted goal of being accepted at the Texas Heart Institute. “This setting provided an excellent environment to learn from many brilliant, experienced cardiologists, and obtain a level of experience not possible at most other training programs,” Sedillo said. He was selected Chief Interventional Fellow his third year. After 15 years of training, Dr. Sedillo said “It was time to get a job!” His search led him to the Bradenton Cardiology Center in 1995, where “they were looking for a fellowship-trained interventional cardiologist who had the additional skill-set to perform peripheral vascular procedures,” he said. During that time Dr. Sedillo said he performed more than 1,000 procedures a year. “The volume I was doing (top 1 percent nationally) attracted industry. I began teaching procedures and techniques to other practicing cardiologists, vascular surgeons, and interventional radiologists,” he said. He also was director of the cardiac catheterization lab at Manatee Memorial Hospital in Bradenton. In May 2011, Dr. Sedillo founded his independent practice, CardioVascular Solutions Institute, with an office located in Bradenton. Since then Dr. Sedillo has been named director of the Percutaneous Coronary Intervention program at Doctors Hospital in Sarasota, an association that is a good fit for him, the hospital and area residents, he said. “Doctors really has worked hard on this…They built a state-of-the art, $2-million cath lab just for this program. I really have to give Doctors kudos. They not only met but exceeded the required standards for a PIC program,” Dr. Sedillo said. When he’s not seeing patients, teaching other physicians or doing clinical research, Dr. Sedillo cherishes time with his children. Although no longer married, “their mother and I share common values and expectations when it comes to raising our kids. She is an amazing, dedicated mother,” said Dr. Sedillo.